Speakers:Green Mountain Audio Callisto (on sand filled Skylan stands), Hyperion Sound HPS-738, AV123 Strata Mini, (2) REL Q108 Mk II subwoofers. Instantly recognizable by their bulky network boxes, MIT is one of the pioneers of the high-end cable industry. MIT founder Bruce Brisson started designing cables back in the 1970s and eventually licensed his first designs to Monster Cable. You might recall Monster Cable’s breakthrough Interlink Reference from 1981 which featured many of Bruce’s patents such as “Bandwidth Balanced”, “Phase Correct” and “Time Correct” windings. This was the first high-end cable specifically designed to reduce the inherent distortions of audio signal-carrying cables. In 1984, Bruce formed Music Interface Technologies (MIT) and continued to develop new cable technologies culminating in MIT’s patented low-pass filter network concept or Multipole Technology. MIT has also designed or manufactured cables for other audio companies such as Wilson Audio Specialties, Spectral Audio, Jeff Rowland Design Group, Martin Logan and Goldmund Audio. MIT products are also used in many recording studios and film production facilities such as Skywalker Sound. Many audiophiles have pondered on the mystery contents of those black boxes. Some have even cracked them open, posted pictures on the Web and expressed disappointment on finding mere inductors, caps and resistors. What were they expecting? Dilithium crystals? It should become obvious to anyone who takes the time to browse MIT’s website what’s in these boxes. Even the logo for MIT’s Multipole Technology features a stylized representation of a cap, inductor and resistor. While MIT has revealed some interior pictures of their networks recently, they are deliberately vague on precise details. Bruce and company have spent over 30 years and considerable amounts of money researching and developing their designs and understandably don’t want to share it with their competitors. In the end, it’s the results that matter and not what’s in the box. MIT cables come in two different flavors, MA (Maximum Articulation) and 2C3D (2 Channel 3 Dimensional). 2C3D cables are available from online dealers while traditional retail stores handle MA. Simply put, 2C3D technology offers a more middle-of-the-hall perspective with the emphasis on directionality and dimensionality. 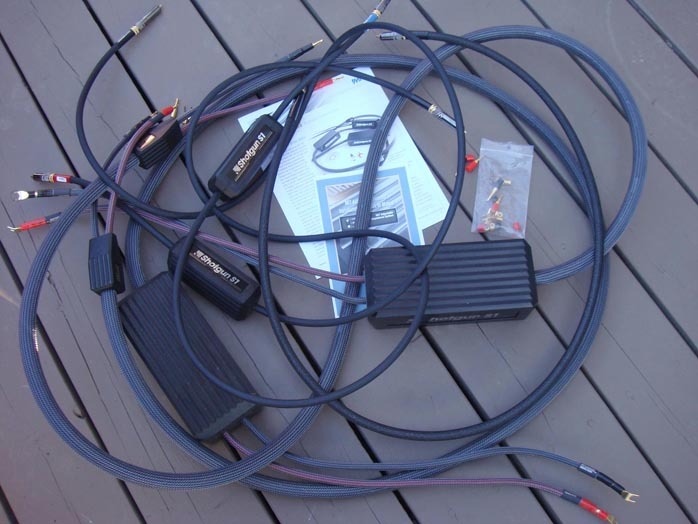 2C3D products include all Series One (Shotgun S1, for example), Series Two (Oracle V1.2 for example) and Generation 3 (Shotgun S1.3, for example) interconnects and speaker cables. MA brings the performance closer to you for a more visceral experience that focuses more on timbre and texture. MA products include the AVt MA, Shogun MA, Magnum MA and Oracle MA interconnects and speaker cables. This isn’t to say each lacks the sonic characteristics of the other. They are simply voiced differently. During a phone conversation with Bruce, I asked why MIT offers two product streams. He indicated that this was primarily customer driven as folks have tended to prefer one to the other. I like it. Give the people what they want. As I tend to focus more on timbre, texture and harmonic richness than I do on soundstaging and imaging, I’d probably favor the MA cables. Taking this to its obvious conclusion, I suggested to Bruce that he could essentially design cables for any specific system or preference. He replied that’s exactly what MIT does for its pro sector customers where cables are designed to match specific input and output impedances of each piece of studio equipment to achieve maximum transparency and resolution.